Paramore are one of those bands that are a gem for live music photographers: an extremely dynamic stage show with an iconic frontwoman and bombastic lights that all make for a fantastic challenge. Having caught Paramore opening up for No Doubt earlier this year, I was excited to see the pop-punk heavy weights for their headlining tour. 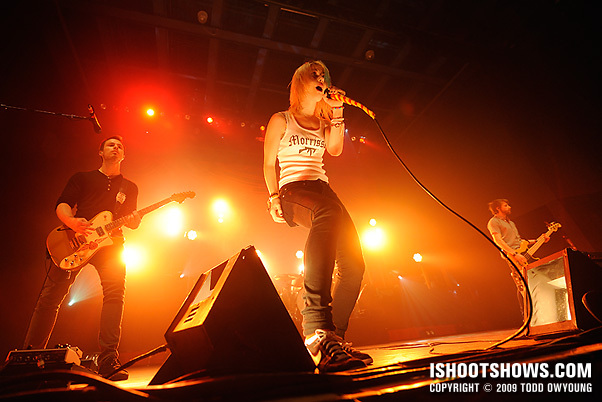 Paramore of a huge challenge in many ways, not the least of which is the band's use of dramatic lighting. Of course, this is a “high class” problem, because the band's lighting treatment makes the band look great when it's on full blast. 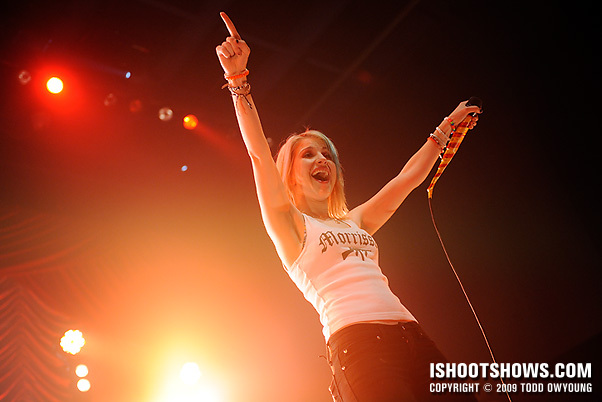 However, as variable as the lighting is for this tour, the biggest challenge for photographing Paramore is singer Hayley Williams. Williams is nothing short of a firecracker on stage, dominating the front monitors and whipping the crowd into a frenzy with every gesture. If you're photographing this tour, expect a small workout if you want to keep up with Hayley, especially if you have to fight through a crowded photo pit. oh my god, i’m still, and always amazed on your work todd. Looking forward to more amazing shots! keep it up! Thanks for the comments and support. Regarding focusing, one thing you’re seeing here is that I do personally place an emphasis on a technical execution whenever possible. That is, I always prefer that the images I show are sharp and in focus. Of course, there are always exceptions to the rule, but part of what you’re seeing here are my editing preferences. However, in general, one thing that will improve focus is knowing what to tell the camera to focus on in the first place. High-contrast areas are always going to allow the camera a better and faster lock. Forget the cute young lady that can sing like crazy- I’m drooling over the lighting. 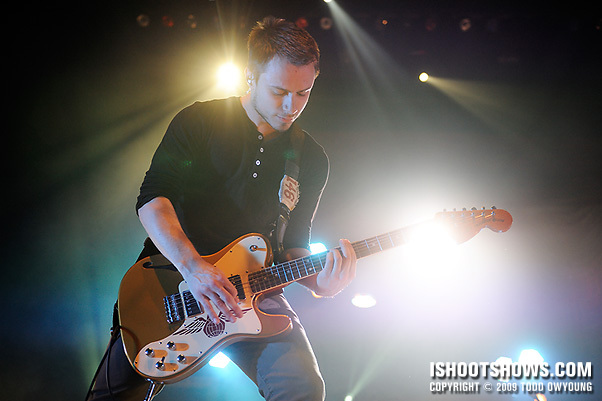 They always have an awesome lighting scheme on every tour. Great set as always! 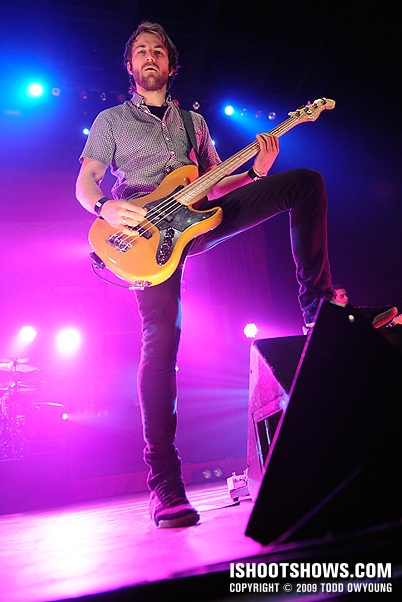 Yeah, Paramore’s lighting designer is an OK guy in my book. The lighting for this tour was much more atmospheric than their stage treatment for No Doubt’s tour, but still a top-notch job. Thanks for the comment. Nice to hear from you here, thanks for the comment. Good luck with the shoot! Hope your stage is lower than mine. If I shoot them at Soundwave Festival than no way…8ft stages at that setup! also have to try find a new outlet before then!!! Good luck with the move, hope you find a good place at a publication or two in the new year. Great shots Todd. I think my favorite angle is the one of her at the front of the stage, leaning back with her Nike in the foreground. Great perspective shot. Thanks for the comment. 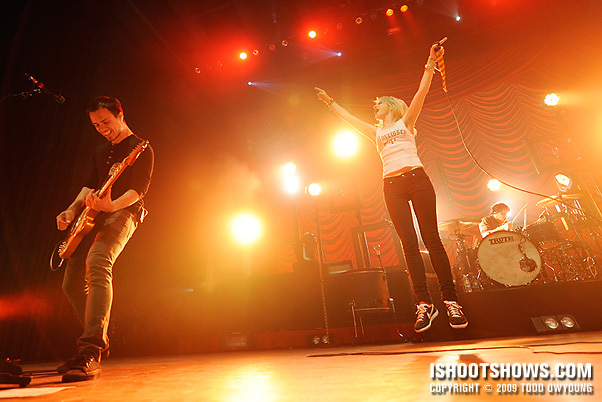 14mm + Hayley Williams is bound to be a little fun, though this wasn’t as much of a wide-angle show due to the height of the stage. However, I do think this gig was nicer to shoot in some ways because the band didn’t have all the monitors at the front of the stage as they did opening for No Doubt. Great shows, either way, with very nice lighting. Taylor was stage left. You can see photos of him in this set here. i love your work todd! Thanks very much for the kind words. Even if tickets aren’t available for the show, you might want to still inquire about photographing the show. Good luck, hope it works out. Thanks again for the comment. I’m a student going to photography school, and I really enjoy taking live concert shots. I find it really challenging to take shots as brilliant as yours, because of the low lighting environment. 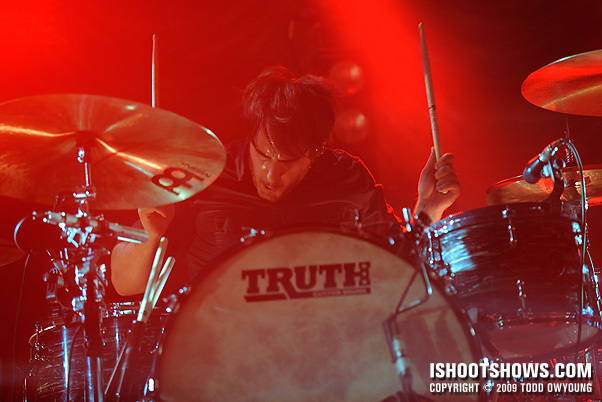 When boost up my ISO, i get grainer photos.. when I use flash, I don’t get the nicer lighting of the stage lights. And of course when I try to open up my aperture and shoot at a slow shutter, I don’t get the crisp sharp mid-air photos. So, as much feedback or suggestions you have would be appreciated. 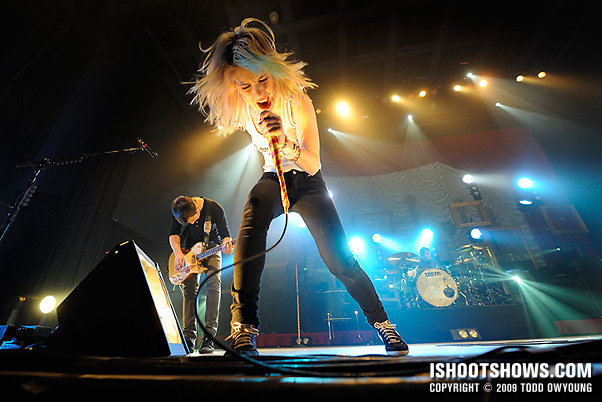 I’m shooting Paramore at a concert next week, and am hoping I can really step up my game, but not have to rely on my portable flash and still achieve the energy/motion with the stage lighting. These photos are so great! 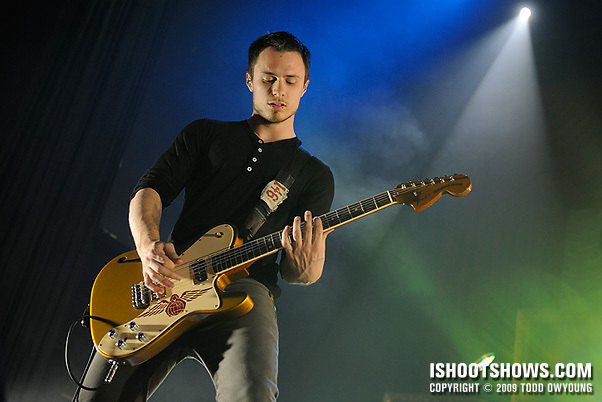 I so much appreciate live shots, especially ones that look this fab!! I was wondering, may I get your permission to make a few graphics from your photos? Sorry if I missed any disclaimer that you may have posted about this! These are so so great and I would like to make some icons/banners for livejournal (paramoremusic in particular), but only with your permission. Every single photograph is amazing, I love them all. 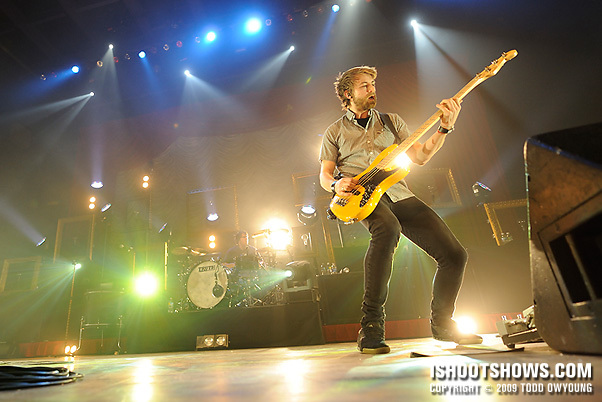 Great work and can’t wait to see ATL and Boys Like Girls photos. I am a huge fan of your work, as well as Ami Barwell’s. I’m new here, and I know you use Nikon gear, so are you using an SB-800/900 with a CTO filter on it to do your fill flash? (I’m looking at the shot of Haley bent over and her mouth is lit inside) The color correction and balance with stage lights and a bare flash don’t seem to do well in my experience. The stage lights are starting out as incandescent lights have a yellow color temp, and the strobe is blue. I use a 1/2 CTO on my SB-800 and dial it down about 2/3’s of a stop for fill. I’m dying to try a D3s. ISO off the hook. OK, I realized my stupidity as I hit the “speak” button. You are shooting major acts, and they don’t allow a strobe. Still, I don’t know how you got that shot without one. I shoot in crap clubs with crap light with a D80 and a 17-55 2.8 Nikkor. There is nothing below ISO 1600 of value on the D80. Color balance is what it is. Noise Ninja rescues me on a daily basis. Yet, the light don’t lie. Is it in photoshop? I don’t do much photoshop work, and even though most of my shots are tremendously underexposed at ISO 1600, f 2.8 and 1/50 sec, how the hell do you get such technically awesome work? You are a genius, and I’m in awe. I want your brain and rig, or your brain with a D3s with a 50mm 1.4. Hey Todd! This is a great work! I’m glad to visit your site. I really enjoy your work and it’s an inspiration for me…. this is completely AMAZING!!! They way you get your angles is very col. I like your lightning technique, is ISO 1600 what you were using here? or higher? Keep up the god job! Thanks for the comment – hope the tutorials are helpful, please feel free to submit a question to the Q&A if you have something in mind that isn’t covered. 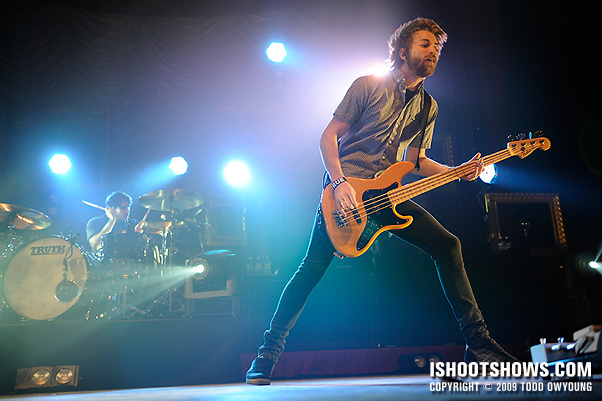 I love this set Todd…I was lucky enough to shoot Paramore when they hit the UK a few weeks after you shot them. 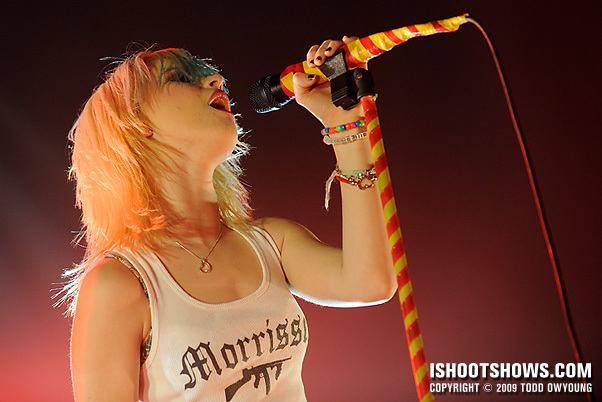 You can see my pics here: http://davemussonphotography.wordpress.com/2010/01/21/paramore-birmingham-nia-11th-december-09/ they’re not as good as yours but then they never are! 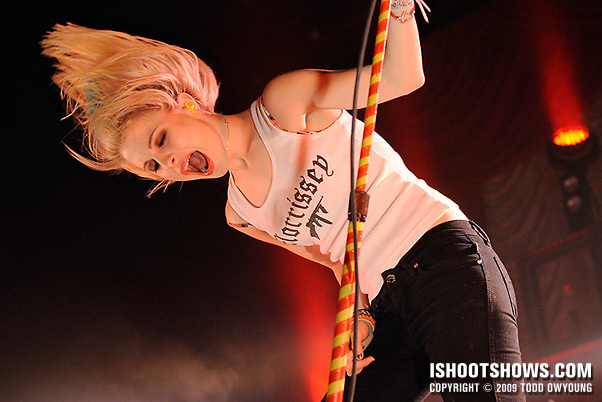 And I can totally agree with you about having a mini workout to keep up with Hayley – it was very tirring, particularly having to dodge another 12 snappers in the pit AND security AND emo crowd surfing kids that came flying in constantly! Great Shots, I actually met you at the paramore concert @ the Pageant, it’s awesome to finally see your website and view your photography. I’m just getting into concert photography, i’m shooting my 1st big concert and i wanted to thank you for your helpful tips, thanks man!